A The only player of that name I can find is from a decade earlier. Jack Lindsay made his debut for Clyde in the 1948-49 season. He made just three League appearances and wasnt in the team which lost the Scottish Cup Final to Rangers. He made nine appearances in 1949-50 before becoming a regular the following term, turning out 24 times out of a possible 30 League games. He played every game in 1951-52 when Clyde were in the B Division and won a championship medal. 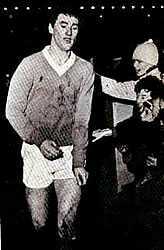 Jack was also in the team when Clyde won the 'B' Division Supplementary Cup that term. His last term with the Bully Wee was in 1952-53 when he played 16 times in the League. Q Were Ronald De Boer (Rangers) and twin brother Frank De Boer (Barcelona) the last twins to play in and win a major European trophy? In the 1995 Ajax v AC Milan European Champions League the twins played for Ajax who won 1-0. A Yes. They were not only the last twins but the last brothers as well. (Phil Neville was on the bench while brother Gary played for Man Utd in the 1999 European Cup Final). A Not as far as I can tell. Cowan graduated from schoolboy football in Paisley to local junior side Mossvale during the Second World War. He signed for St Mirren before moving to Morton in May 1944. 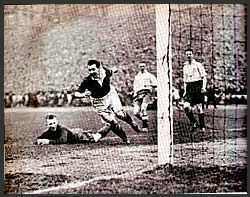 He remained at Cappielow for nine years, winning 25 Scotland caps before his 26th birthday in just five seasons (1947-48 - 1951-52). Incredibly, six of these came in 1949-50 when Morton were a 'B' Division team. After a further season in the lower league he was transferred to Sunderland in June 1953 for £8,000. He made 28 appearances for the Wearsiders in his first season but none the following term and returned to Scotland to play for Third Lanark in November 1955, retiring from the professional game at the end of the 1955-56 season. Jimmy Cowan died in 1968, aged just 42. Q From GreenockFan: "What is the record home crowd for Greenock Juniors?" A A crowd of 8,000 turned up at Ravenscraig Park for a Junior Cup quarter-final tie against Johnstone Burgh in 1960. Greenock won and went on to beat Ardeer Thistle in a semi-final replay at Firhill to reach the Final just four years after their formation. They lost 3-1 to St Andrews United at Hampden in front of a crowd of 34,603. Oddly enough, Greenock's visit to St Andrews' Recreation Park in the Junior Cup the next season provided a record 11,000 gate for that ground. The junior game was obviously pretty healthy in the early 60s.